After winning the Cy Young award in 2015, Dallas Keuchel had a follow-up campaign that really can only be described as disappointing. His ERA ballooned from 2.48 – good for second in the AL that year – to 4.55, 32nd in the AL out of 39 qualified pitchers. A glance at Keuchel’s peripherals indicates that his fall may not have been as dramatic as it seemed, as his xFIP was a solid 3.53 — the second-best mark of his career, actually, after adjusting for league and park. But a pitcher who sees his ERA rise by over two runs certainly isn’t content to rely on things to right themselves. So Keuchel took matters into his own hands. 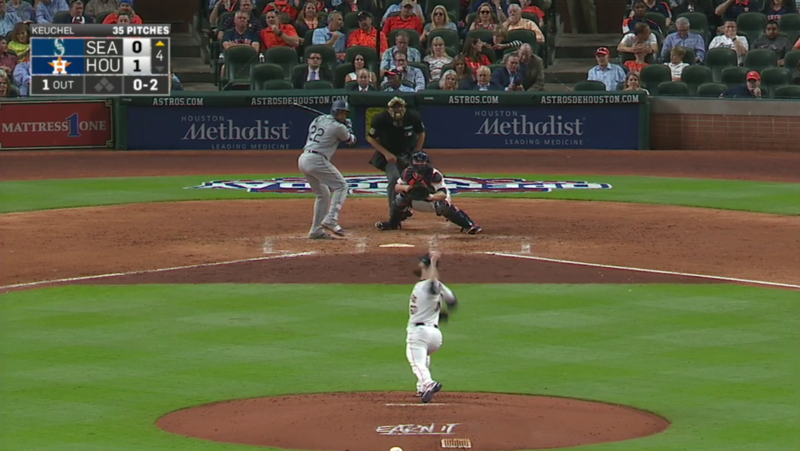 Keuchel’s always been known for keeping his pitches down in the zone. It’s what helps him get so many ground balls, which in turn keeps down the production on the balls in play he allows. Except there’s one part of that table which sticks out: Keuchel’s wOBABIP (or, wOBA on Balls in Play) last year. Despite the left-hander’s high ground-ball rate, hitters made some pretty solid contact against him. His average exit velocity both on grounders and fly balls increased by 3 mph from 2015 to 2016. What could create such a spike? The most likely explanation is probably just luck, both of the good kind (in 2015) and the bad kind (in 2016). Of course, we know that a very big part of BABIP and wOBABIP for pitchers is luck, so any huge swing from one year to the next is almost certain to have fortune to thank. And as Dave pointed out a year ago, Keuchel got the most extra strikes on pitches out of the zone in 2015. 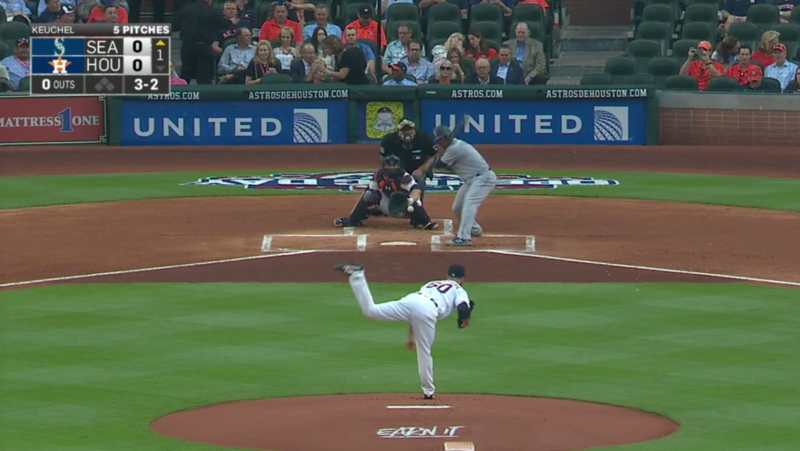 (It wasn’t really close, either: Keuchel got 174; second was Jon Lester with 143.) Last year, Keuchel got only 106. That forced him to pitch more in the zone; his zone rate increased, and hitters had more opportunities to make contact. But there are other reasons. It’s possible that Keuchel’s command took a dip last year, leading to a higher BABIP, as he couldn’t locate hitters’ weak spots as effectively. After all, his walk rate in 2016 was his highest since 2013. Keuchel’s velocity dipped, too, with all his pitches besides the changeup featuring a tick less than the year before. And even though his ground-ball rate was still very high, it was a full five percentage points lower than years past. So in his first start of the new season, what did Keuchel do to get back to 2015 levels? Since he’s obviously already trying to command his pitches as well as he can, and there’s only so much he can do about velocity, he did everything in his power to get more ground balls. The best way to do that is simply to throw lower, and so Keuchel threw lower. 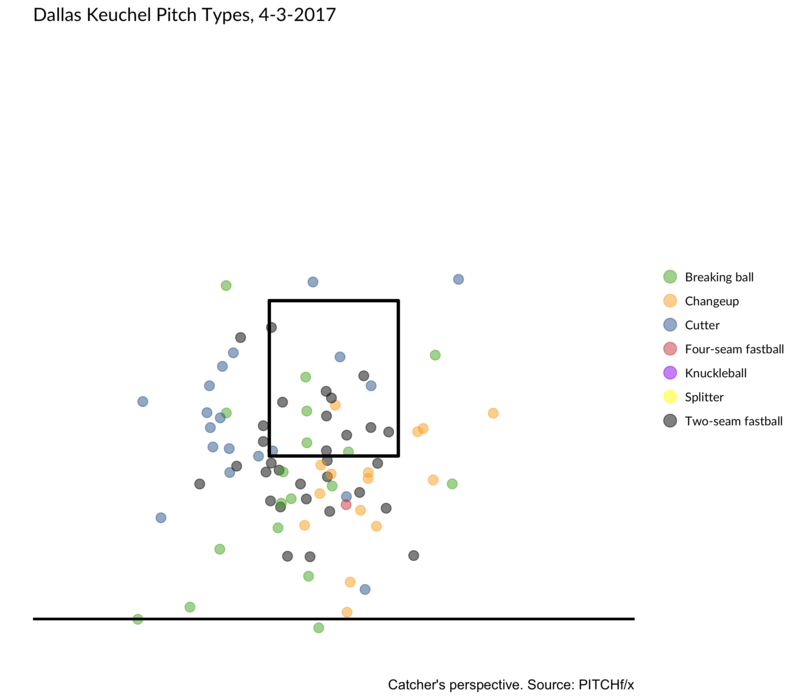 After locating 62% of his pitches in the bottom third of the zone or lower last year, and 65% in 2015, Keuchel came out throwing a ridiculous 80% of his pitches low on Monday. That’s Keuchel’s highest percentage in a single game ever. Out of 24,811 starts since 2012 during which a starter threw at least 50 pitches, Keuchel’s low-pitch rate was the 35th highest. He stayed far, far away from the top of the zone, too, throwing just 7% of his pitches up in the zone, compared to 17% last year. The average height of his pitches was 1.67 feet off the ground on Monday; it was an even 2.00 feet last year. On top of that, Keuchel nearly completely abandoned his four-seamer, a pitch which typically generates fewer grounders than others. He threw only one of them all game after averaging over 10 per start last year. He upped his changeup usage, a pitch which generates grounders at an above-average rate. The strategy worked. Keuchel wasn’t his sparkling 2015 self, but he got the job done. His control was somewhat iffy, as he walked two and hit another. But he got 11 grounders compared to five balls in the air, a ground-ball rate of 68% that would be a starting-pitcher record if were able to sustain it over a full season — or, at least since this kind of thing has been measured. (Bunts excluded.) He allowed only two hits, both to good hitters (Robinson Cano and Jean Segura). 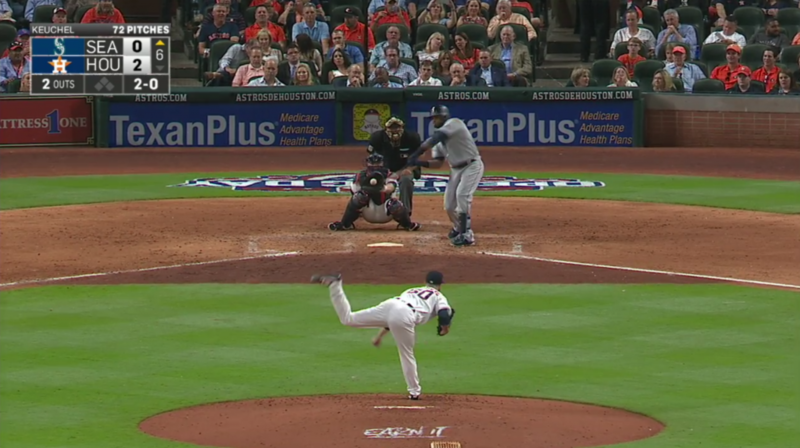 … although Cano’s hit was a mistake. 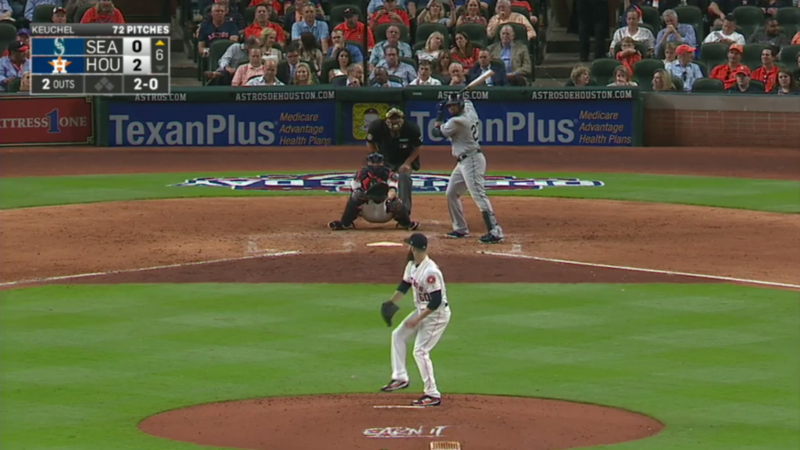 Keuchel left a breaking ball up and over the middle of the plate, and it was pulled by Cano through the infield. It remains to be seen if Keuchel continues with this strategy. It worked this game, but throwing so many pitches out of the strike zone might not be viable long term, especially with MLB raising the zone from where it has been in past years. Keuchel lives down there, so one would think that rule change would affect him negatively, but he was more aggressive than he’s ever been throwing low. Clearly, Keuchel thinks it’s worthwhile to throw low and get more grounders, even though he might walk some more people. Keuchel threw only 28% of his pitches in the zone last game; no starting pitcher in the PITCHf/x era has come anywhere near that, so I doubt Keuchel will continue throwing so few strikes. No starter in the PITCHf/x era has come close to throwing 80% of his pitches low, either, so I doubt Keuchel will continue to do that, as well. But as exaggerated his approach Monday may have been, this is a version of Keuchel we might see a lot of this season. After all, throwing low is Keuchel’s bread and butter, and if doing it more often brings him success, there’s no reason for him to stop. We hoped you liked reading Dallas Keuchel Is Trying to Recreate the Magic by Jonah Pemstein! The extreme O-Zone strategy may have worked particularly well because the opponent was the Astros, an extreme high-strikeout team. As you say, we’ll have to see if the strategy (i) continues to be used by Keuchel and (ii) is successful. BTW, that 2nd bunt put-out was amazing. I happened to be watching that live and thinking ‘he’s not actually going to throw it, is he?’. Off of his back foot yet! His opponent was the Mariners? They’re not a high strikeout team. Ach! Keuchel is on the Astros! I’ve been staying up too late watching west coast baseball. Well, with the Mariners not being a high strikeout team, maybe this approach bodes well for Keuchel? Also, the Astros are projected to have the 2nd lowest strikeout rate for their hitters. They’re not an extreme strikeout team anymore.